This post was sponsored by Amopé™ as part of an influencer activation for the #AmopeCrowd and Socialstars™. I received complimentary products to facilitate my review, but all opinions are my own. Even though I’ve been done with college class-wise since December, I only just graduated with cap and gown and all last week. For me, the milestone signified the unofficial start of summer. That, plus the fact that I’m going full time with blogging starting next week, makes this summer a special one! Besides traveling, I want this summer to be a relaxing one. It’s funny— since we moved into our new apartment this time last year, I haven’t once used any of the pools we have in our complex. Weird, right? But this year that will change for sure. It’s not as blistering hot as it usually is come June, so I have a feeling I’ll be relaxing out there much more often. One thing I’ll have to get over though, is wearing sandals. Yep… I’ve never been a fan of sandals because I hate how my feet look during summer. They feel dry, itchy, and unattractive! Plus, wearing sandals tends to make my feet feel rough after a while since they’re more exposed to the elements. But, over the weekend I found these cute-as-all-heck strappies for under $10 that I just had to buy… so I needed to get my feet in shape fast. First step was using my Amopé™ Pedi Perfect Wet & Dry Rechargeable Foot File to get rid of any patchy areas of skin. Not only does this add finesse to my style, making and keeping my feet as pretty to look at as the shoes, but also lets me take a little time out of my busy schedule to just chill… using the file is actually kinda therapeutic! 😛 I’ve noticed that the Amopé™ foot file also helps my feet not become as itchy after swimming and being exposed to the sun, since I’m getting rid of the dry skin regularly. Next, a few coats of polish on the toes. Even if you don’t go bold, like I did to match the sandals, just a pale pink can help your feet look more clean and nice to look at. I always thought a fresh pedicure is a sign that you take care of yourself and are well groomed. And with those two insanely easy steps, I’m not so self-conscious about how my feet look in sandals or barefoot… which means I will definitely be rocking this pair all summer long. It probably also means I’m going to have to go on a sandal shopping spree to fill the gap in my shoe collection. 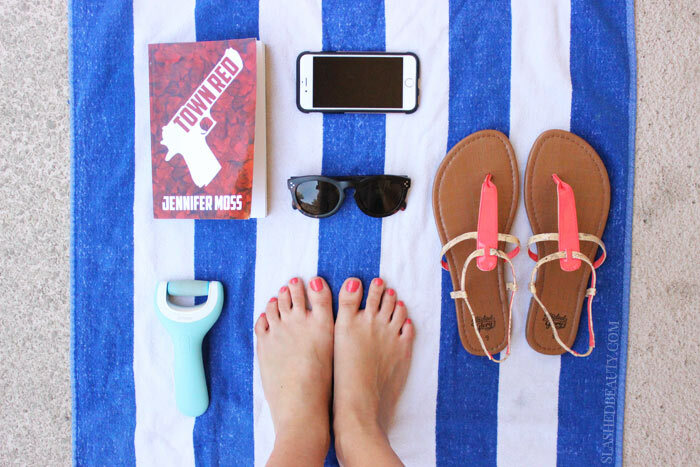 Check out the Amopé™ Pedi Perfect Wet & Dry Rechargeable Foot File on Amazon, it’s a great beginning-of-summer treat for yourself! If you’re totally ready for summer, pin the first picture! Love my Amope foot file, it really does a great job keeping my feet smooth. This little tool sounds awesome. So far this summer I’m taking care of my feet using Peppermint oil and almond oil mixed. It’s literally peeling the dead skin off my feet. I rrrreally need to take more and better care of my feet! Usually I remove calluses every two weeks but I find that in sandal season it’s just not enough. I have a similar electronic foot file and love it! I really need something like this. Definitely need an amope for the summer. Love the pedi color. I love my Ampoe. Those sandals are adorable!! Your photos are enough to make me want my feet to look just like yours.